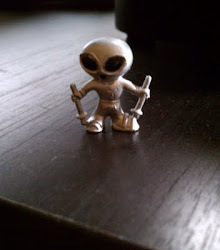 I have seen the future of UFOlogy, and you can, too. 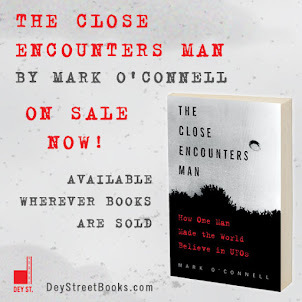 As regular readers know, I was presented with the opportunity last week to go to a film studio in Massachusetts to see a demo of Doug Trumbull's amazing new UFO detecting and imaging system called UFOTOG, and when the opportunity appeared, I pounced on it. And I'm glad I did, because it was a pretty great experience. First of all, I have to thank Connecticut MUFONer Marc Dantonio for making it all happen. If I hadn't clicked on Marc's Facebook message last week, I never would have known about the event. Even better, Marc arranged for me to spend the weekend at the apartment for the production crew, which was pretty cushy. Doug and his wife Julia were wonderful hosts, and when they opened up the studio to their guests it was like being ushered into wondergeekland... There was a huge green screen set, where the entire UFOTOG movie was shot... There was a scale model of a "Magi" movie theater of the future, where films will someday be shown using Doug's new 3D projection system... There was the huge military Humvee with the clamshell roof that can carry the UFOTOG anywhere UFO activity is occurring... and there was the first of the UFOTOG rigs itself, lacking its phalanx of cameras but toting enough gleaming telescope power to put the Hubble to shame. Can you tell I was enjoying it? The screening of UFOTOG was stunning. Doug has made a 10-minute film that serves as a teaser for a planned feature-length film, while also showcasing his 3D system and the UFOTOG system. Sounds like a lot to juggle in 10 minutes, but it works: the movie starts out with a bang and maintains a manic, break-neck pace until the final frame. But if it was just the spectacle of the effects and the 3D it wouldn't amount to much; the movie tells a really fun, exciting story that makes you want more. What more can you ask from a movie than that? And, damn, that UFOTOG system! It's so cool! Of course, I only saw it in action within the confines of the film, but the way it's portrayed there is pretty astounding. Imagine going birdwatching with a pair of binoculars that actually locates the birds in the brush or in flight, tells you their genotypes, calculates their trajectories, analyzes their chemical makeup, takes X-rays, MRIs and CAT scans of them all at once, tells you what's in their poop, reads what they're thinking in their little heads and breaks down the audio makeup of their bird calls. Yes, your neck would get very sore and your arms would get very tired, but the point is you'd have that birdie nailed! Now imagine that same set-up, only a million times cooler and aimed at the night sky out of the roof of a Humvee on a lonely mountaintop. It's going to happen, and it's going to require an awful lot of volunteers. Somehow I don't think that will be a problem. 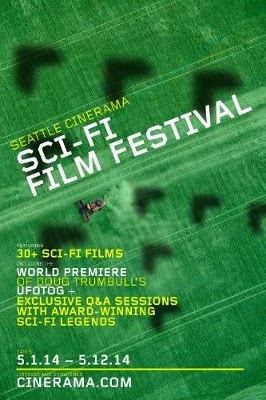 Best thing of all is that anyone who can get to Seattle on Sunday, May 11th can see it too, at the fabulous Seattle Cinerama Theater's Science Fiction Film Festival. I've already contacted these nice folks about attending, and now I'm asking you! This thing is gonna succeed if the suits see that theater filled to capacity for all three screenings of UFOTOG. If you or anyone you know can get to Seattle on May 11th, GO SEE IT. You will not be sorry. Did I mention Doug will be doing a Q&A after each screening? You bring the Qs, he'll have the As. And if you can be there Friday and Saturday, you can also see some of Doug's other work: "Brainstorm," "2001: A Space Odyssey," and "Close Encounters of the Third Kind." Just tell 'em High Strangeness sent you. Your enthusiasm is through the roof, it sounds like a very impressive array of imaging technology. Let's hope that it pays off with some killer footage and data of unusual areal phenomena! Wish I could make it to Seattle, but that's probably a tall order. I do have a friend who lives there, I'm going to send him the link. Any chance that this 10 minute teaser will ever get posted to YouTube or some other online resource? Boy, I hope it never shows on YouTube... If it were to be shown in any online format, everything that makes it so dynamic and beautiful would be compressed right out of it.